It can be tricky combining one's passion for different things in life but a chap named Søren Juel in Copenhagen seems to have managed it. Drums are his life as owner of the very cool drum shop and workshopDrumstick. He is also a Copenhagener which means, of course, he gets around by bike. 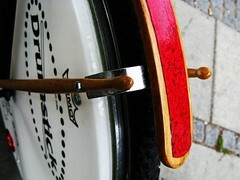 Enter the Drum Bike [Trommecyklen]. The idea started when a drum playing bikesmith who frequents the shop suggested a hybrid between drums and bikes. It took time to work out how different drum kit gear could be set onto a bike, but they succeeded in the end. 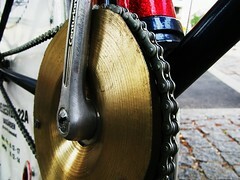 Wherever possible drum gear is used, like the cymbal on the chain above. The fenders are made from 26 inch vintage Premier Bass hoops, with original Gretsch Red sparkle coating. They're held in place by drumsticks. On the wheels are drumskins with an advert for his shop. 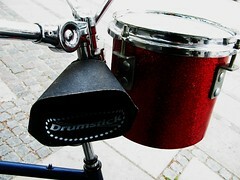 Drumsticks can be placed in the holder on the frame and a cymbal hangs from the crossbar. Søren admits that the drum stool isn't the most comfortable to ride around on for longer journeys - for those he uses his old 'granny' bike to get around. 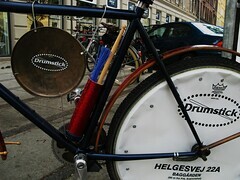 But during the Copenhagen Jazz Festival he only uses his Drum Bicycle. 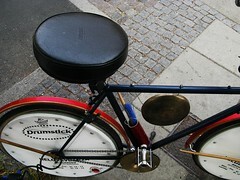 Bells are required by law in Copenhagen, and the Drum Bicycle is no exception. Just grab a drumstick out of the holder and give this cow bell a whack to let them know you're coming. 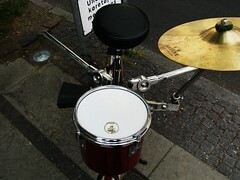 The handlebars are made out of drum kit and there is a cymbal and a drum mounted on the front for spontaneous cyclobeats. 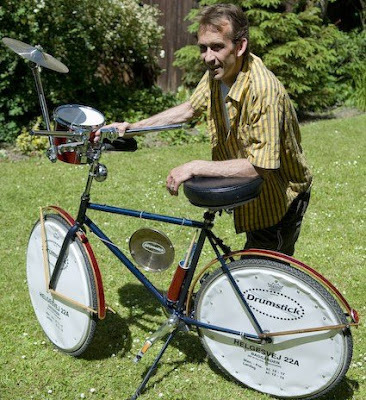 Customising one's bike is popular in Copenhagen and Søren Juel leads the band with his Drum Bicycle. Drumstick is located on Helgesvej 22A in Frederiksberg. The bike is usually parked down on the corner of Helgesvej and Falkonér Allé during opening hours, used as an advert for the shop. The Copenhagen Jazz Festival is the second larget jazz festival in the world and takes place each July.